Several questions and complaints have come up on the eFaucets customer reviews on PissedConsumer. The most common eFaucets complaints are in regards to the company’s shipping policy, deliveries, returns, and refunds, how to contact customer care, quality of products, and customer service among others. How do I contact eFaucets customer service? What is the eFaucets.com return policy? Can I get a refund from eFaucets.com? What is its shipping policy? What is the pro-pricing program? We then went ahead to find answers to the top eFaucets FAQs on www.eFaucets.com and other reputable websites and forums. 1. How do I contact eFaucets customer service? PissedConsumer has provided various eFaucets customer service numbers including two toll-free numbers, a chat link, eFaucets customer service email address, eFaucets headquarters address, eFaucets social media networks, and the time when the eFaucets customer help is available. There are links to the various eFaucets social media networks: Facebook, Pinterest, Google+, Instagram, Twitter, YouTube, and LinkedIn. 2. What is the eFaucets.com cancellation policy? As evidenced by the eFaucets reviews on PissedConsumer, a number of customers have been in a position where they wanted to cancel their orders and were wondering about the eFaucets cancellation policy. eFaucets FAQ state that they are willing to accommodate cancellation requests for instances such as if the customer entered the wrong shipping address, or ordered the wrong item, or the ordered item was back ordered. 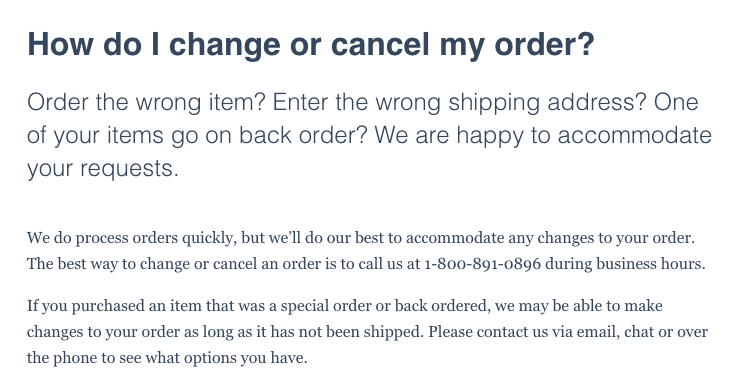 Alternatively, you may opt to change your order instead of canceling it in the cases where your item was back ordered. The best way to cancel or change your order is by contacting eFaucets customer support through their various contact channels including via the phone numbers, chat link, or email address during business hours. 3. What is the www.efaucets.com return policy? According to eFaucets FAQ, the company provides a 60-days return policy for customers who change their mind about an item or the item does not work as expected. Customers may request to return an item within 60 days after receiving it. Once eFaucets has received the item and inspected it, they will refund the item amount less the return shipping fees. Refunds for large items will be less the return shipping fees and 10% restocking fees. eFaucets stipulates certain conditions on general returns of items including the item must be in resalable condition, it must not have any scratches or defects, it must not have been installed or assembled, it must be returned in the original manufacturer’s packaging, must not be missing any pieces, must not be an item bought during a clearance/liquidation/closeout sale, and when resending it you should remove the writing on the original manufacturer’s packaging. The company also allows for the return of the special order items. 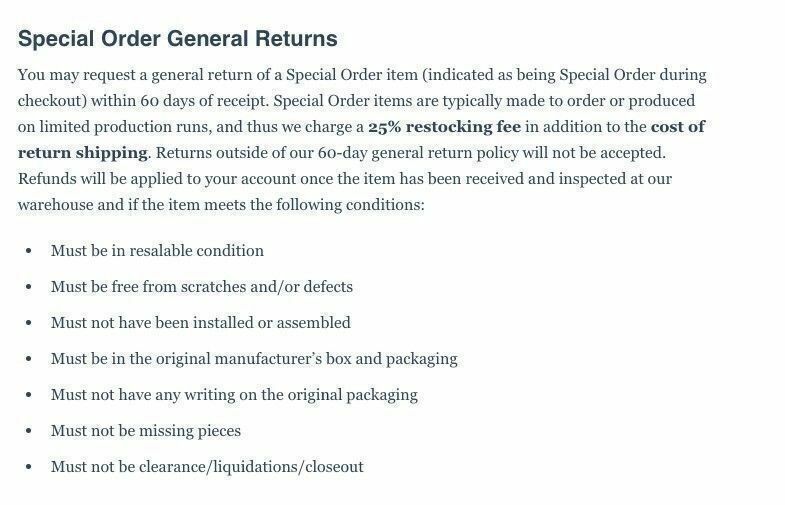 Refunds on special order items are less the returns shipping fees and 25% restocking fees. 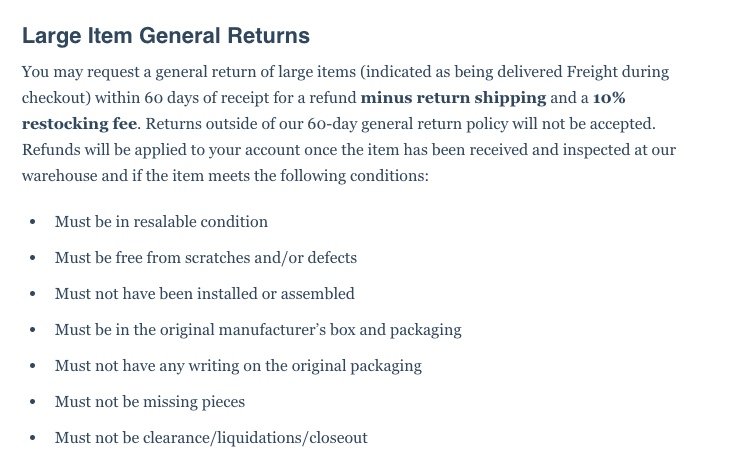 As with the general returns, you must return the items within 60 days of receiving them. 4. How can I request a return from eFaucets? 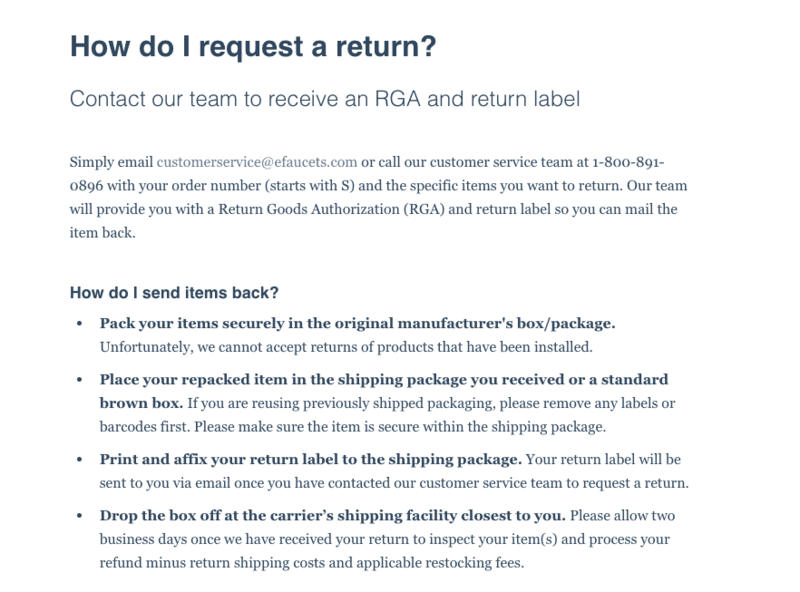 Once you have been issued with an RGA number, pack the item you want to return securely in its original package or a standard brown box. If you decide to use the original package, ensure to remove any labels and barcodes. Print the return address label and affix it on the package. Drop off the package at the carrier’s shipping facility nearest to you. The company notes in eFaucets return policy that returns will take about two days to be received. They do not accept the return of products that had been installed. 5. Can I get a refund from www.efaucets.com? eFaucets on their help center state that they make refunds on returned items. Customers have up to 60 days to return the items. 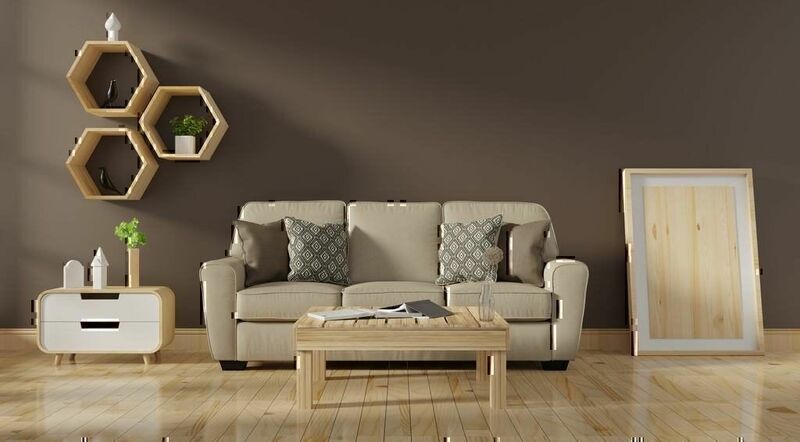 As per the eFaucets refurn policy, once your returned item has been received, it will be inspected and eFaucets will process you refunds less the shipping costs and any applicable restocking costs. eFaucets takes up to two days to receive and inspect the returned items and issue a refund. However, the amount of refunded can take up to 30 days to reflect on your account. 6. My eFaucets.com items arrived damaged. What do I do? 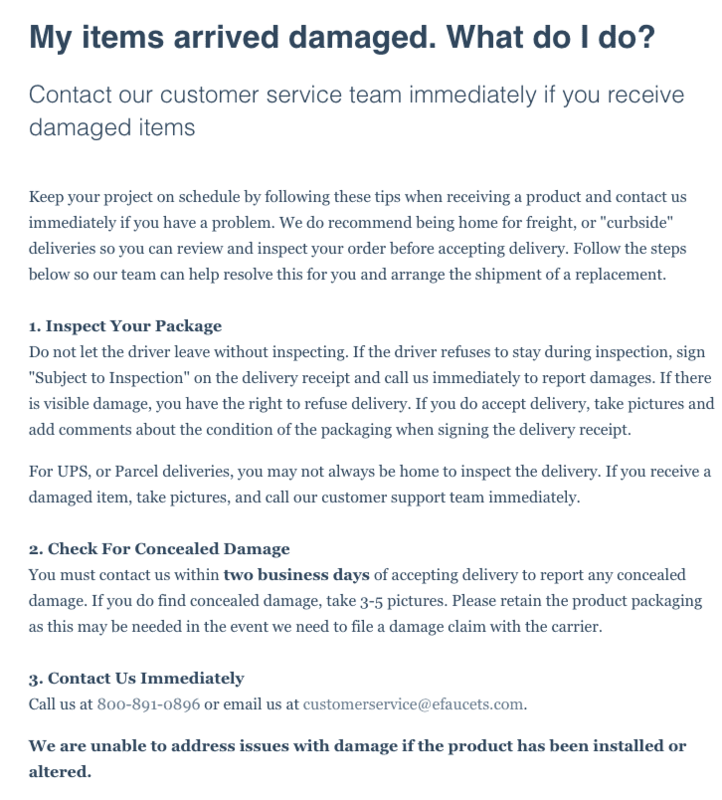 According to the eFaucets help center, if you receive damaged items, you should get in touch with the eFaucets customer service team immediately. Ideally, you should inspect your items for any damages while the driver is still there. If the product is damaged on arrival, you have the right to refuse the delivery and send it back with the driver. In case the driver refuses to wait for you to inspect the items, or if you do not have enough time to make the inspection sign against “Subject to Inspection” on the delivery receipt and add a comment about the condition of the packaging. Inspect your delivery within 24 hours. eFaucets requires that you contact the customer service within two business days of receiving the damaged items. They recommend that you take 3-5 pictures of the concealed damage. It is important that you retain the original product packaging as it may be required to file a damage claim with the carrier. eFaucets notes that they are unable to address damage issues for items that have been installed or altered. 7. 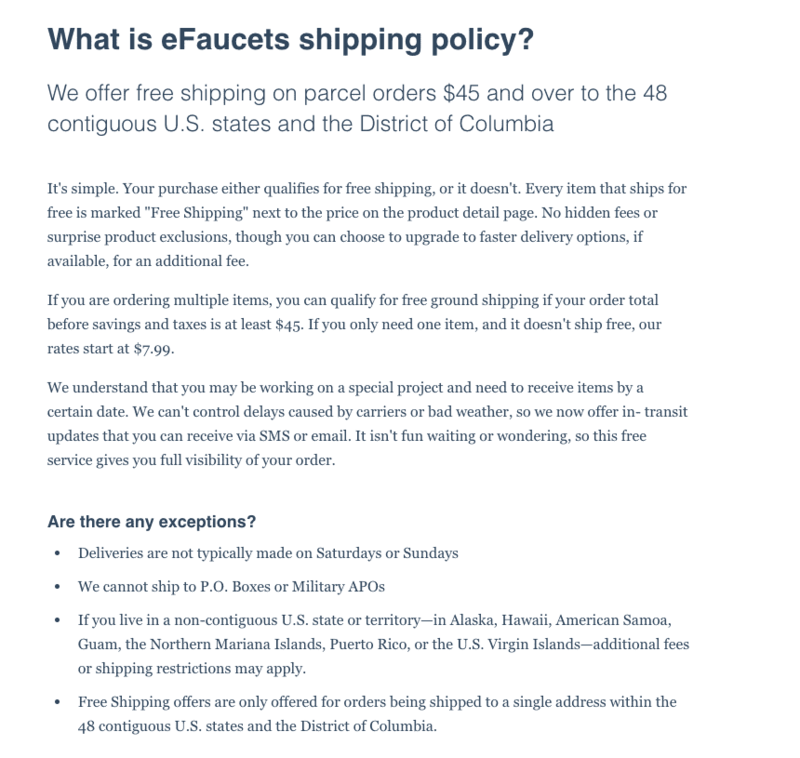 What is eFaucets shipping policy? The eFaucets shipping policy stipulates that some products qualify for free shipping while others do not. Usually, items that qualify for free shipping are marked as “free shipping” next to the price on the product page. eFaucets offers free shipping on parcels orders $45 and above for deliveries to the 48 contiguous US states and the District of Columbia. The $45 applies even in cases where you order multiple items and the order total before savings and taxes is $45. The company order rates start from $7.99 for orders below $45. eFaucets notes that they strive to ensure no hidden fees or surprise product exclusions on their deliveries. Furthermore, customers can opt to upgrade to a faster delivery option, if it is available, for an additional fee. eFaucets offers in-transit updates via SMS and email for items being shipped. While they do their best to deliver products by the requested date and time, the company urge customers to bear with uncontrollable delays caused by carriers and bad weather. As at the date of writing this article, eFaucets has a 2.1 average rating on PissedConsumer. Most of the eFaucets complaints on our website are against issues such as poor customer services, unfair returns policy, wrongful billing, delivery delays, poor quality of products, delivery of damaged or used products, and inaccurate representation of products on the website among others. “The gist of it is that they sold a cheap product for a lot of money, and refused to take it back with the excuse that it was "custom made". I have filed complaints with Amex, BBB and DATCP. On the other hand, there are a few customers that expressed total satisfaction with the eFaucets customer service, shipping, delivery service, and the pricing of products in eFaucets reviews. “…Their customer service is top notch and they were more than willing to make sure they offered the best price around, even beating homedepot and build.com. Many thanks guys! 9. What is eFaucets pro-pricing program? eFaucets offers a pro pricing program to its customers. The pro-pricing program offers members exclusive pricing on products and access to a dedicated pro sales team that helps members save time and money in identifying and buying products. 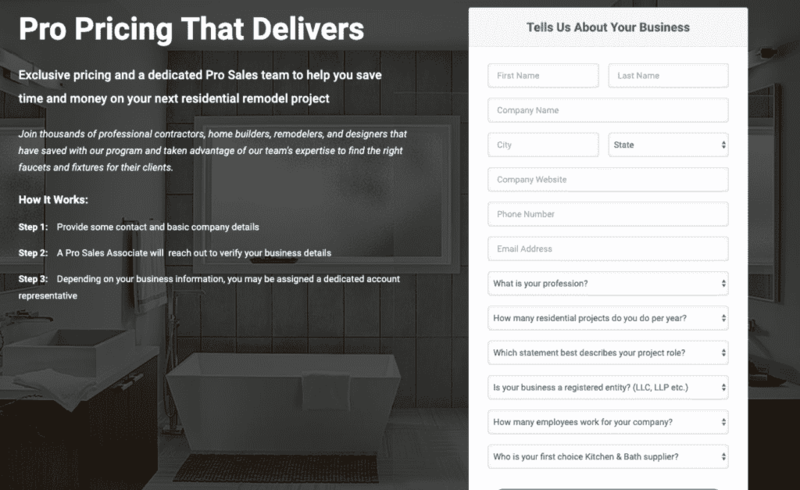 This program is mainly targeted at professional contractors, home builders, remodelers, and designers who usually run large remodeling projects. The pro pricing program offers them custom quotes, discounts, fast and free shipping, and 60-days return policy. In regards to discounts, items marked at “hot buys” are excluded from the pro pricing program discounts. On the help center, eFaucets notes they are currently unable to offer the pro pricing program via the website. To enroll into the program, contact the eFaucets customer care team. You will be asked to provide your basic information to enroll in the program. Do you have an eFaucets complaint, review, or question that is not addressed above? Ask a question on the eFaucets Q&A page on PissedConsumer. Write a review about eFaucets on PissedConsumer. Get in touch with the eFaucets customer service. Visit eFaucets website and help center to find answers to eFaucets FAQs.